Most of the animals people are very familiar with are members of the phylum Chordata. Chordates are physically the largest members of the animal kingdom. We humans ourselves are mammals, one of the classes of chordates, and so are our pets like dogs and cats. Much of our meat, such as beef, poultry and fish, comes from chordates as well. 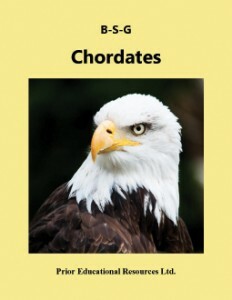 This biology study guide unit on Chordates begins by introducing their essential features. It then turns to a consideration of specific members of the phylum: first simple ones, and then a survey of the various classes, starting with the three classes of fish, then Amphibia, Reptilia, Aves, and finally Mammalia. Throughout this survey, there is a focus on the development of highly specialized organ systems, and particular attention is paid to some unique features contributing to the survival and success of these animals. Chordates is excerpted from our Biology 11 Study Guide, which is the fourth edition of a student study guide written to match the curriculum of British Columbia. The concepts presented are applicable to the biology curricula of other educational jurisdictions as well.